You should be good going by now, enjoy playing with sguil client console! If you install Activetcl version 8.4.x, then just run wish8.4 sguil.tk instead. 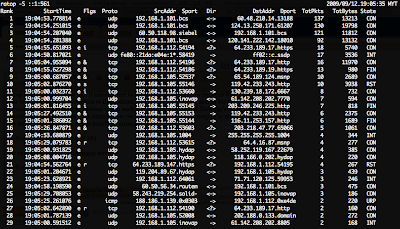 Many people write about Nmap 5.0 when it is released, here's how I get it work on Mac OSX. If you are installing Nmap 5.0 using MacPorts, then you won't be having zenmap in your pocket, you will only get ncat, ndiff and nmap. Therefore it is best if you can obtain the nmap installation package for OSX from Nmap website and follow the instruction here to get it installed. Once you have the package installed, you may figure zenmap will not work properly even though you can run it. In fact you need the following software installed to satisfy the dependencies. You might want to check it out, it definitely supports pcap format file! 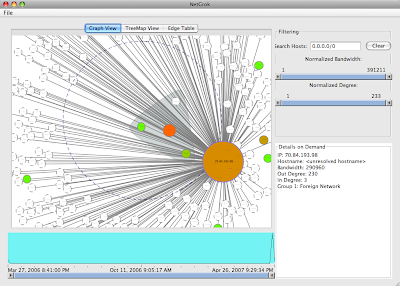 For more information you can check out at NetGrok site. You need to know the current state of the network, who is probing your network and services, who is consuming your bandwidth, what are the stuffs running in your network, the main question remains - How much you know about your network? Then people talk about Situational Awareness, in fact Wikipedia has well-versed explanation about it where you can find here. To quit ratop, it is similar to exiting vi editor, just type :q and you will disconnect from argus monitor. You can see that ratop is very useful when comes to monitor your network in real time, while it doesn't offer you insightful information, it gives quick view of the layer2/3 network conversation. Other features such as sorting can be toggled on with :s, or filtering with :f.
This is considered part 1 which I have ratop covered, and for part 2 I'm going to discuss about rasql/rasqlinsert, then I will introduce ralabel in part 3. All of them are very effective tools for Network Situational Awareness. You can check out it's manual and source code which is hosted at Google Code here. All you need to do is download, verify, decompress, upload it to your OpenWRT, and run! Currently it seems to work on my testing machine. I will introduce more about the new argus client tools such as ralabel, rasql, rasqlinsert and etc in my coming posts. All for now, I have been idle for a while and hopefully this is come back to be active me. Hack In The Box Security Conference 2009 in Malaysia is going to happen again on October 5th-8th 2009. We are looking forward to see the security crowds again! More information about the conference can be found at this link. Again this time, me and mel(spoonfork) are going to conduct network security training for Hack In the Box 2009 Malaysia. This upcoming training is going to be brand new and focusing on scenario case solving, with the title of "The Art Of Network Forensics: Going Beyond Packet Data", the detail for the training is at here. We haven't finalized the course materials that are going to be provided to students yet, however if we can obtain the kit to build the network tap, then it will be awesome. On the other hand, we would like to thank to Vickson again for his cool banner design! This year, I thought things are going to be smooth for me, and I was wrong. But I do know life goes on. So I'm now out for job again and plan to settle down a bit. This is the first time I put up my resume here, and hopefully can get the right job for myself quickly. I'm looking for job related to firewall/ids/siem implementation/deployment/analysis/response. If you think there's any opportunity I can grab, or you are interested to hire me, please let me know. Here's my resume. 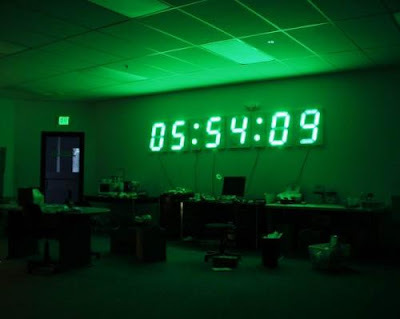 We have been trying to fight with the time synchronization issue when running FreeBSD on VMware. With the new FreeBSD(7.1 and above) and new VMware workstation/fusion, the problem is fixed. That's great as it means we can run HeX more flawlessly on VMware. On the other hand, HeX is back to active development, stay tuned! 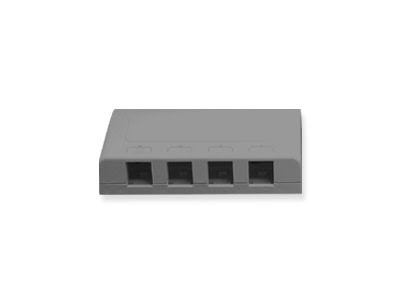 I have been looking for 4 ports surface mount box(cat5e compatible) which looks like the above image, if any of you know where I can find in Malaysia, or you sell it, please let me know. I would like to order 20-50 units from you. I want to order online but it is out of stock here. On the other hand, if you know anyone who sell cat5e keystone jack with reasonable price, I would like to buy as well. My plan is to build network tap using this mount box, and as a gift to whoever attends my future network forensics training. 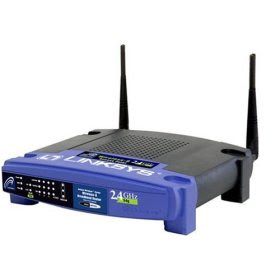 I have bought two units of Linksys WRT54GL wlan router previously so that I can run Linux and getting network security monitoring tools running on it as well. This little device has very limited space but you can't beat linux as router device. One of the unit is currently living in spoonfork's place to serve that Darth Vader, and another one is with me. Since Carter has argus supported on OpenWRT, I have been thinking of getting argus installed on it(MIPS platform). And after some tinkering, I have successfully loading argus on it and export the network flow to another box in the network. Here's the complete howto that you can follow exactly to get argus compiled for OpenWRT Kamikaze 8.09(MIPS platform) using Ubuntu Linux. I have found some good references here to get me going, and I would like to thank to David Watson(UK Honeynet) for his guide on building nepenthes on openwrt too. Since this embedded device has very limited space, there's no point to run packet logger locally, other tools I would like to run on it so that I can export pcap to other system should be something like packetforward or rpcap. If anyone has experience to get any of these tools installed on OpenWRT, please do share! shell>nvram set rc_firewall="/usr/sbin/iptables -I INPUT 1 -p tcp --dport 12345 -j LOG"
shell>nvram set rc_firewall="/usr/sbin/iptables -I INPUT 1 -p tcp --dport 12345 -j ACCEPT"
Thanks to the link here. 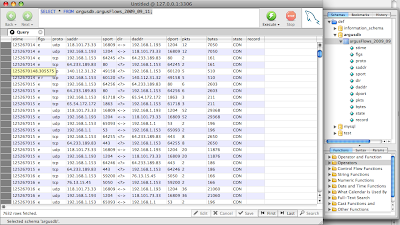 Yes, you can decrypt wep using airdecap-ng from aircrack-ng suite, or using wireshark gui. However you can also use tshark to decrypt wep with known key, and you can define many keys to be used to decrypt wep packets as well. By the way, you can also decrypt wpa similarly. This is trick for Mac OSX users, if you want to capture 802.11 WLAN packets, you can't do that with normal capturing argument using tcpdump. Normally en1 is the wireless network interface for Apple Macbook. If you want to analyze 802.11 traffic, you can definitely play around with this. Of course if you want to put your Macbook into RFMON mode, the best tool around is Kismac. This year HITB Dubai is coming again, there will be 3 technical trainings and good line up of speakers so don't miss it! More packets for the monkeys! Many people have urged me to update my old Netdude installation guide, I don't know what went wrong for them but here's how I get Netdude 0.5 installed on Ubuntu 8.04. Make sure you have debian packages that I mentioned in old post installed properly via apt-get, now download Netdude 0.5.0, libnetdude 0.11 and libpcapav 0.8 from here. The sequence of installation is libpcapav -> libnetdude -> Netdude. The reason why I like to use stow to manage my software installation is that I can install multiple version of netdude in /usr/local/stow first, and choose which to use by stowing and unstowing(stow -D) them. There you go, it should be flawless unless my memory sux(though I'm). I have written about how to install unicornscan on Ubuntu previously here, and it seems a lot of people have problem getting unicornscan compiled on Ubuntu/Debian. So here's the revisit of mine to make it more clear and it should work on Ubuntu 8.x if you are following the steps accordingly. 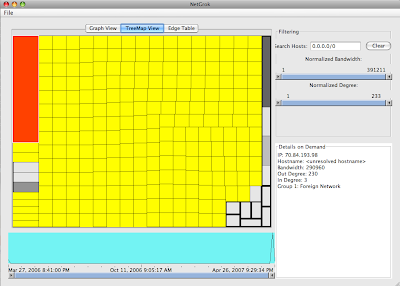 And it even works on Mac OSX! I'm Malaysian who works in Network Security Industry.